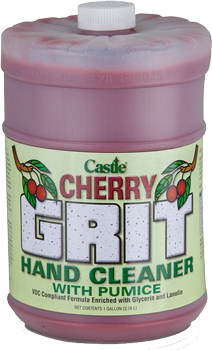 Castle® Cherry Grit™ hand cleaner features a unique blend of cleaners, safe solvents, surfactants, emollients, and skin conditioners. 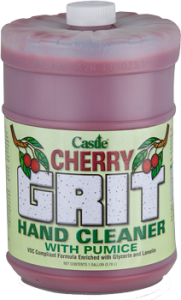 It effectively removes dirt, grime, adhesive, paint, tar, and grease. Skin conditioners and several grades of pumice have been added to help keep hands soft, yet clean. It is VOC compliant and completely biodegradable.